Yesterday I completed week 2 of my 18 week Chicago Marathon training plan with a 6 mile run in Hines Park. I ran a total of 15 miles for the week. I have 407 miles to go before race day. Yesterday’s workout was a group run with Team World Vision Detroit, some of the friendliest people I know. Just as friendly were the dozens, maybe hundreds of runners from Love Runs who we also out training for the Detroit Marathon. (Most of our members are training for Detroit, although there are a handful of others on the team that will be running Chicago with me.) Love Runs is a local group from Northridge Church in Plymouth, Michigan, the town where I grew up. Like Team World Vision, they are running to raise money for a cause. Theirs is combatting human trafficking. Not in some faraway country, but right here in Southeast Michigan, one of the worst areas of the United States for this horrific practice. As we passed on the path there were shouts of “way to go Love Runs!” and “good job World Vision!” It’s amazing how motivating a few words of encouragement from a total stranger can be. In my 10 years of running I have seen that runners are for the most part a very amiable group. Many times when out for a solo run I’ve come alongside a runner I don’t know. Conversation seems to flow naturally as we talk about each other’s next race and how the training is going. It may only last a minute or two until the faster of the two pulls ahead, but it always gives me a little boost. 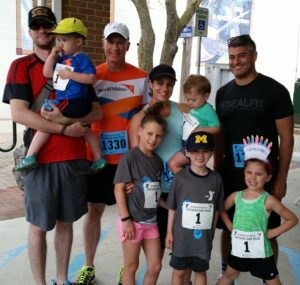 Today I ran with my favorite runners of all – my kids and grandkids. Plymouth has an annual Father’s Day running event. Races range from a 1/4 mile kids fun run to a 10K. It has become a family tradition as we have run it 4 out of the last 5 years. This year was extra special because my youngest, Cameron, was able to join us for the first time. He was serving in the US Army in previous years, and was always either in Texas or Afghanistan on Father’s Day. It was also the first year my youngest grandsons were old enough to run (both are 2 and amazing runners for that age), and it was one granddaughter’s 5th birthday. A perfect Father’s Day! I suppose running is technically an individual sport, but I feel a real sense of community with my fellow runners. Whether strangers, casual acquaintances, friends, or family, they are what I enjoy the most about running. I will do some solo runs in the week ahead, but I’ll be looking forward to Saturday when I will again be out in Hines running with my brother and sister runners, encouraging and high-fiving friends and strangers alike. Your post conveys a warm picture of your and other runner’s passion and mission. I like that your lovely family members are involved. It has got to be making fond memories and creating a strong bond among you. May you all achieve your goals and continue your tradition in good health.